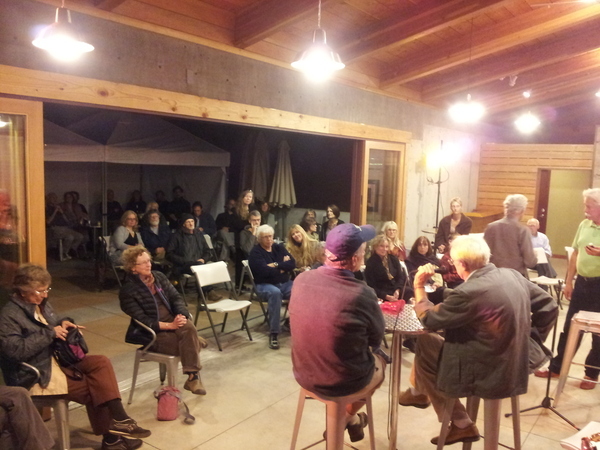 ETB founder Fred Stockwell and Jeff Golden during a Q&A at last year’s fundraiser. This year Fred is remaining in Mae Sot to keep ETB’s projects going uninterrupted. We will have current video updates from him to share with everyone! We are approaching our annual Eyes to Burma fall fundraiser in Ashland, Oregon. If you are in the area, we would love to see you at the event at Grizzly Peak Winery. General admission is $25, student tickets are $10, and children ages 15 and younger are free. There will be live music, a Thai food truck, wine, tea/snacks, a raffle with amazing prizes, and video updates from ETB founder Fred Stockwell, moderated by Jeff Golden of Immense Possibilities. Tickets are available in advance at The Music Coop and Paddington Station in Ashland or at the door. If you aren’t able to make it to the benefit, we hope you will take part in Eyes to Burma Love Day. We have supporters in 18 countries around the world, including the US, and we want to invite all of you to join together with us for a day of celebration and giving on Sunday, September 28, 2014. Our goal is to raise $25,000 to fund the upcoming year’s projects in Mae Sot: continuing to provide the dump community with clean water and first aid, as well as supplemental food, clothing, housing materials and work tools. Education has been made a priority this past year, and many children are attending English, computer and music classes at the dump. Additionally, ETB sponsors six children to attend the Children’s Development Centre (CDC) in Mae Sot, and ETB founder Fred Stockwell is working to get six new students enrolled at CDC in the next school year. To reach our goals, we want to share ETB with as many people as possible, and we need your help to do it. Attached is a digital packet that enables you to share the many accomplishments of Eyes to Burma with family and friends. Several of our supporters have shown these videos at house parties, and we encourage you to consider hosting a house party as a way of spreading the word about our work. For those who decide to host a house party, we would very much appreciate hearing about it. With your permission we could then share your story and photos on our website and Facebook page. 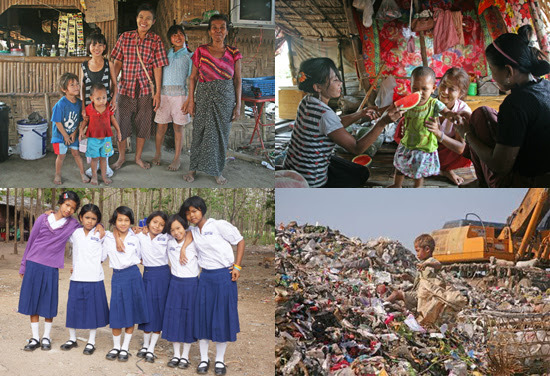 If you do not host a house party, consider taking a moment on September 28th to support the hard-working men, women, and children at the Mae Sot Dump in other ways: with positive thoughts, sharing ETB news, posting our videos below on your social media pages, volunteering, or donating. 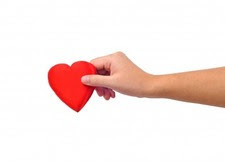 Even donations of $5 make a difference! 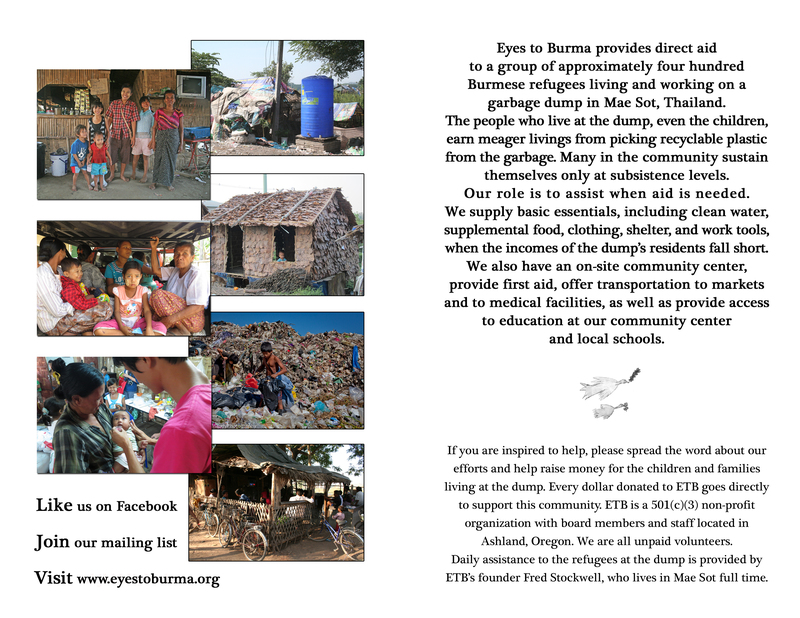 You can of course support ETB and share its news at any time, but we hope you’ll also join us in our global celebration Eyes to Burma Love Day, September 28, 2014.
for the hard-working Burmese refugee community at the Mae Sot dump. Like us on Facebook for current updates!